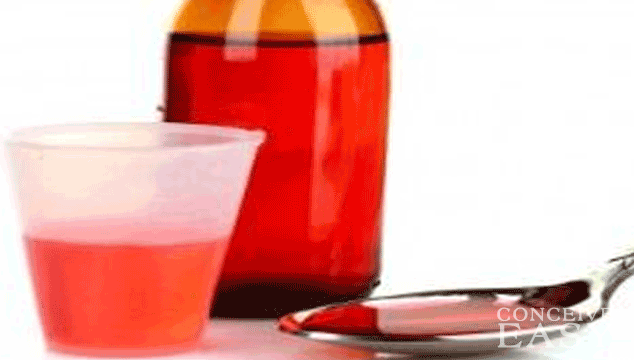 Can Cough Medicine Help Me Get Pregnant? Some doctors even recommend cough medicine for their patients who are taking Clomid, since Clomid can have a negative effect on cervical mucus. Most doctors recommend that women take Robitussin or a similar cough medicine during the week that they are ovulating, usually two to three times per day. If you do decide to try use cough medicine to improve your fertility, make sure that you choose one that has only guaifenesin as the active ingredient. Many cough medicines also contain antihistamines, which can have the opposite effect of what you want, since they are designed to dry up mucus. Make sure that you talk to your doctor if you want to give cough medicine a try to improve your fertility. While there are not many scientific studies out there to show the effects of Robitussin or similar cough medications on fertility, many doctors do recommend this type of treatment for their patients, and this treatment option is said to work by many women who have tried it in the past.